The potato salad we want to introduce you to isn't like any other similar salad. The reasons for this are a) the strong, rich taste of the Gorgonzola cheese, that's the Star of this salad, and b) the filling character of the dish, with the potatoes, and walnuts. That's why this salad is a full meal of its own. You don't need anything else (except perhaps some toast, or a couple of rusks) to enjoy this dish. Most of the potato salads are full of mayo and are served as sides for large quantities of meat in family gatherings and backyard BBQ parties. This one is more exquisite, and needs to have a more prominent role in the table. So it's better to reserve it for special occasions (like Thanksgiving, Christmas, and Anniversaries). You can also enjoy it at any time by itself, as a complete, delicious, filling meal! The base for the salad is the potato. That's why we suggest choosing the best quality, tastiest potatoes you can get. We prefer organic ourselves. The second main ingredient is the arugula. We prefer the baby arugula, which has a milder taste and texture, but go ahead and use whichever arugula you find best. The potatoes and the arugula are then combined with a wonderful mustard-olive oil-garlic-vinegar dressing. 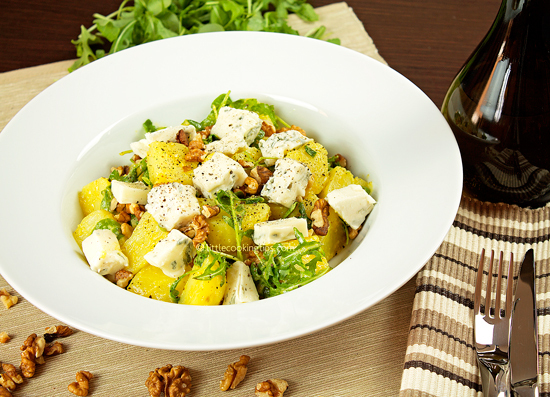 On top, we added toasted walnuts for extra texture and flavor, and completed the dish with cubes of creamy Gorgonzola, that defines the result. For those who haven't stumbled upon Gorgonzola before, it's a wonderful creamy Italian blue cheese with a green-blue marbling. The smell is mild and the taste is rich. You can also use the French Roquefort or Danish Blue Cheese if you can't find Gorgonzola. But in our opinion Gorgonzola tastes better in this dish. You should also note that Gorgonzola is only made with high quality, pure milk because its production is very delicate and depends on the milk used. It has also been suggested that Gorgonzola helps in digestion and traditionally it is believed that it contributes to longevity. The quantity of the ingredients here is for 2 persons (if you plan having it as a meal) or for 4 persons if you plan having other dishes as well. So, if you're a bit tired of those swimming-in-mayo potato salads, this is delicious alternative you should consider! Give it a try; we believe the result will convince you. Preparation: Wash and peel the potatoes, and cut them in 3-4cm/1-1.5in pieces. Place them in a small/medium pot, on medium-high heat and add 1 lt / 4 cups of slightly salted water. Once it starts simmering, reduce the heat to medium, and boil for 20 minutes. Drain in a colander and let them to cool (to room temperature). Put the potatoes in a medium sized bowl, add the arugula (if not the baby kind, chop it) and the dressing (pic.2). Mix gently (to avoid mashing the potatoes) with a spoon (pic.3). When the dressing coats the mixture, place in a serving plate/dish/bowl. Add the walnuts and the Gorgonzola on top, and serve. Kali oreksi! 1. As mentioned, you can also try this recipe with Roquefort or Danish Blue Cheese. 2. You can also add fresh garlic in the dressing, with a different but also interesting result. 3. Rusks or toast are great to accompany this salad. 4. We suggest removing the thin rind from the Gorgonzola before cutting it into cubes. 5. If you want to serve the salad chilled, put the potatoes in a bowl, covered with cling film, and place in the fridge for at least 30 minutes (and up to 3 hours). Then, assemble the salad 5 minutes before serving it, in order to be fresh.